Eurosceptic political parties in Europe have been on the rise over the last few years. What are the reasons for this? What are the main arguments made by Eurosceptics against the EU? The last time I was to Belgium, we didn't actually stop in Belgium. We drove right through from the Netherlands to France. I'm old enough to remember having to stop at borders for long waiting lines. Earlier this year a young colleague of mine decided to tour south-eastern Europe on his vacation. He went into a train to Vienna and by bus and train from there. No plan, just a backpack and a credit card. As he told it, he was surprised that in the train to Serbia people came and wanted to see his papers. He was glad that his national ID card was enough, because he had not thought to bring a passport. We had a good laugh at the office when he told the story. They thought they were getting into a free trade area, now the EU is regulating the shape of cucumbers, the power of lightbulbs, and refugee rights. What has that to do with free trade? Well, people in some of the older EU member states have always seen the EU as a political project, with an ever tighter integration. Others just wanted free movement and structural and cohesion funds, with no strings attached. Nobody told them it doesn't work that way. During the banking crisis, some EU/Eurozone members had to be funded by others. Among the stable and strong economies, there is a perception that some south-eastern members are profligate wastrels who want others to subsidize their laziness. This is not entirely accurate, of course. Industries in countries like Germany, France or the Netherlands benefit from the weaker Euro which would be grossly undervalued if it was just for those countries. Look what happened to the Swiss Franc. The Euro is kept lower by the bad credit rating of some members. Biases enter this perception. Just compare the Latvian financial crisis with the Greek one. Greece got much more blame. While the EU parliament is elected by the people, the rest of the EU decisions are made by representatives of the member governments (who are elected by the people, either directly or indirectly). There are two or three steps between the popular vote and the EU commissioner. This lends itself to claims of missing democratic legitimation. Things are changing. Fast. Think back 10 years and the iPhone was a novelty. Now we have selfies, emoticons, and uber. Amazon is replacing shops. Imagine what will happen when autonomous cars replace trucks and delivery vans. Quite a lot of people feel threatened by the pace of change. Populists see the distant EU as a perfect scapegoat for all the problems. If something goes right, they take the credit. If something goes wrong, they had no choice, it was the EU. Yeah, sure. It hasn't risen much (at least not EU-wide). Taking everything into consideration, would you say that (your country) "has on balance benefited"/"would benefit" or not from being a member of the EU? Taking everything into consideration, would you say that (your country) has on balance benefited or not from being a member of the European Union? In general, does the European Union conjure up for you a very positive, fairly positive, neutral, fairly negative, or very negative image? The data as visualised lack uncertainty bars, and to measure whether there is a statistically significant trend would take more work. However, at first glance, there does not appear to be a strong trend in "has your country benefited". The only partial trend that appears clearly visible, is the drop in the number of people who answer "Don't know" since 2000. 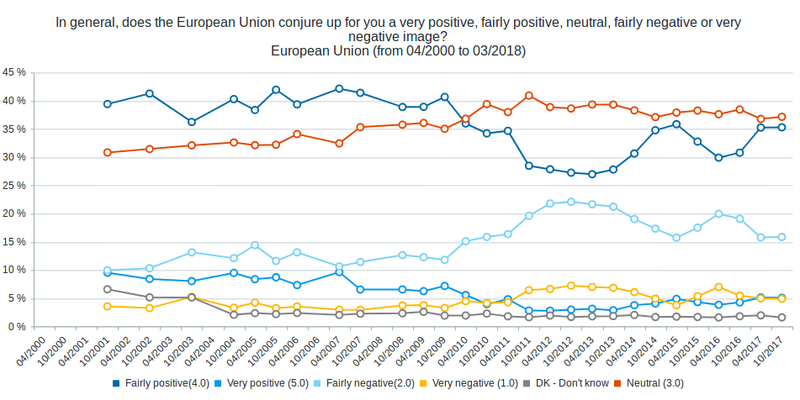 The "image" question does show that between 2009 and 2012, there was a decrease in "fairly positive" from around 40% to around 30%, trending back to 35% between 2012 and 2017. The trend for "fairly negative" is roughly opposite. There appears there may also be some increase in answers for "Neutral", but it would take more in-depth statistical modelling to calculate the significance. One other recent data point, not from Eurobarometer, is a Dutch survey on Brexit and Nexit (=Dutch exit), which states that in 2016, 43% of surveyed people supported a Dutch exit, whereas in 2018, this had dropped to 30%. Among supporters of the Dutch Socialist Party (left-wing), support for exit dropped from 52% to 20%. Only among the populist right supporters is there still a (large) majority for Nexit. Support for populist (far) right (nationalist/conservative) eurosceptic parties overall in The Netherlands have been mostly constant (with many ups and downs) in the past 16 years (Pim Fortuyn, Geert Wilders, Thierry Baudet). I would speculate that the Greek drop in support is due to the Greek government-debt crisis. Conclusion: From available data, there does not appear to be much evidence for a large EU-wide trend in feelings about the EU, either pragmatically (whether it benefits the member state) or emotionally. Overall EU trends may mask trends in specific countries, and there may be other trends not visible in the data as presented either. The trends differ from country to country, and for those countries where there is a clear rise (such as Greece) the answers are likely specific to factors affecting that country. 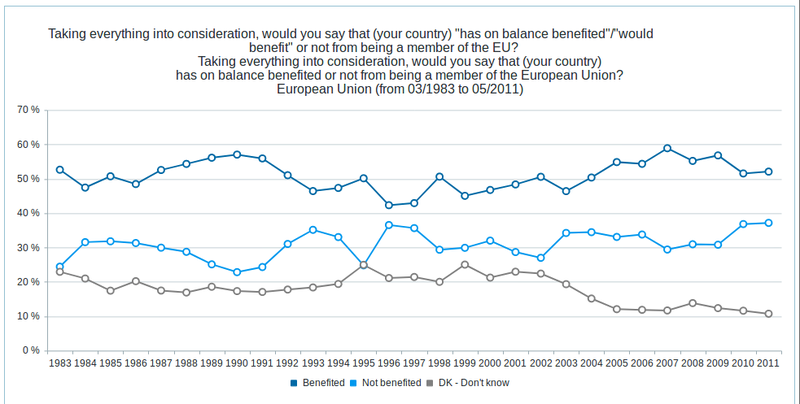 Discussion: Clearly, there is a perception that euroscepticism has increased, more than it actually has. Where is this perception coming from? I would speculate (but have no evidence) that with the rise of populist right parties in some European (and non-European) countries in the past 20 years, eurosceptics in continental Europe have become more vocal (I believe they always have been vocal in England), people are more willing to speak their opinion when it is not aligned to the establishment. With the rise of such parties, eurosceptics have received a voice in national parliaments, and, more than before, in the mainstream media. I want to add one important point that I believe is a key factor especially in the perception, and that is what in Germany is called "über Bande spielen", maybe best translated as "indirect play". It's a political trick that has become more common in the last decade or so. Basically, any political measure that the ruling party wants, but that is unpopular and would negatively impact the next election is instead brought forth on the EU level, discussed and made into an EU regulation. Then when it comes to the national level to be implemented into law, they put on a show of reluctance and fighting against it but ultimately (insert imagined sigh) they are force to do it by the evil EU. Measures with a positive image are, of course, introduced locally with a big show of "look what good we are doing". This way, a lot of what is perceived as negative apparently comes from the EU, and very little positive. This trick has become common and some journalists have uncovered endless cases where sometimes the same politicians championed a bill on the EU level and very publicly, valiently and sigh ultimately heroically fruitlessly fought against the same bill on the national level. But this case of political schizophrenia rarely enters the mainstream media and public memory. This way the EU is made the scapegoat for many, many unpopular measures that actually did not originate at the EU level, while popular measures, even if they do originate with the EU, are celebrated as national government success stories. Because EU membership was sold to people with two very important promises: 1. There would be less regulation and bureaucracy, more freedom 2. The sovereignty of nations would not be infringed upon. Nations would not be forced to do things they did not agree upon first. Both were boken. Badly. There are a LOT of regulations coming from the EU (as a governing body), leading to increased costs and hurdles in most if not all areas of life. And while there are areas where it did lead to decreased regulations and costs, for a lot of people the net balance is negative. One good example where i live are people who used to do small scale, often part time farming. They used to be able to sell their crops and animals to local large scale food manufacturing companies for a good price. This money was either a considerable chunk or all of their income. But with EU regulations on farming, especially the raising of animals, the costs became too much for a lot of these small scale farmers and they either had to completely abandon farming or were relegated to selling only to private individuals, under the table, for a lot less money. This has hurt a lot of people in my country, most of them being in the poorer, rural areas. Also, as it turned out, a surprisingly large percentage of our national agricultural output came from these small farmers, and losing that did not go over well with people. As for the second part. The obvious example is the handling of the migrant issue, and the migrant quotas that some countries tried to impose on others through EU laws. That is viewed (rightfully so IMHO) as a gross violation of the sovereignty of the individual nations. There are already a lot of issues with how some national and EU politicians are pushing for more and more centralisation of power in Brussels, against the will of a lot of the people in the EU, and the political ideologies they are pushing/forcing on people with said powers. But the handling of the migrant crisis is viewed by a lot of people as a critical crossroad. For them the outcome of it will decide whether the EU can be made to work or if it needs to be abandoned. This is a typical case of inadequation between the expected benefits and the perceived ones. The topic is complex, and an in-depth explanation of it would probably not suited for the scope of this site. However, some elements might help you grasp an idea. The problem when you do a revolution, is that you typically agree that the guy who's there is bad. You all work together to get rid of him. But once that's done, you often fight amongst yourselves, because you never took time to find a system for afterwards. The French revolution, or even Lybian revolution (for something more recent) come to mind. The EU has a bit of the same issue. With 3 "large" wars in 80 years (Prussia-France followed by the two World Wars), involving progressively more people and killing exponentially more people each time, both the leaders and the people of European countries felt like something should be done. But what? People often expect the EU to spread humanist views, favour human rights, environment, peace, etc. So we would all be living better, to make sure that will share the best standards in Europe. We all live in peace, like each others, so we won't be waging wars again. Some others, and among them many industry or polical leaders, are more focused on the economy. A shared market, leads to a shared economy, increased inter-dependence, and thus impossibility to do any total wars. And making some profit on the way won't harm much. From the very beginning, the EU has been a ship trying to compromise between those approaches. The 1957 Rome Treaty claimed to be adressing the former, whereas the first actual agreement, merged the coal market. During the Cold War, the EU was building and expanding itself, but partly as a way to protect itself from the USSR as well as keeping some independence from the USA. The USSR disappeared, the memory of the World Wars faded, people started to evaluate what they had built. Many feel that the EU is too administrative, and restraints the free exchange and market. Others that the EU is too business oriented and not doing enough for the Human Rights, Environment, and general protection of the population. The Parliament is directly elected by the European people. People can somewhat understand that, as it is quite common in the national systems as well. It holds legislative power. The Court is somewhat separated, but holds judicial power. This entity often exists in one form or another in each country. The commission is a complex and puzzling entity. It holds both executive and legislative power (often avoided in separate countries). It is composed for a part of the representants of each member countries, for a part of nominated people. That complexity makes it hard to follow who takes which decision and who should be held responsible for each new rule. And that puzzles voters. There is a huge communication issue for the EU. Except in very rare cases, the EU does not promote itself so much. Whenever there is a debate on national politics, you would see representatives of both sides in all news medias: radio, TV, press, etc. But you would rarely see the same thing whenever there is some debate at the European level. We French people regularly get to hear Muscovici (current European Commissioner for Economic and Financial Affairs, Taxation and Customs) in the media, but most of the time he is being asked about national politics rather than European ones. I don't know if it's a question of consumer's interests, journalists, or EU officials, but the result is that for a large portion of the population, the EU institution looks like a black box, completely separated from "normal" people. Even national politicians communicate European decisions sparingly and only to achieve national goals. More or less latent since the 1970s, we live in a continuous "crisis". That crisis has many facets: economics, moral, societal, technological, etc. The economics part of it exploded since 2007. People are by nature resistant to changes, and thus somewhat preoccupied about the future. And whenever we are in a crisis (or simply perceived to be in), we tend to look for culprits. Jews for example, have often been considered culprit (Geman's loss at the end of WWI, a few economic crises in the Holy Roman German Empire, etc.). It tends to unite a population against the culprit. This is something often used by extremist parties. The rise of populism isn't something specific of Europe. The famous "Make America Great Again" of Trump is a clear illustration. The crisis is due, for some people (or presented as such), to the globalization, world economy and multinational firms. These are many heads, and hard to focus the hatred against. In Europe, the EU institutions are an embodiement of those. So by focusing the distrust and hate against the EU, those parties capitalize on the fear of many people. I can only speak from the British perspective. I don't feel that euroscepticism has risen at all in this country. Throughout my lifetime it has seemed that among our politicians roughly half were in favour of EU membership, and half were against. I don't think that has changed. Most ordinary British people don't care whether we're in the EU or not. But there are things they do care about, such as healthcare, job-security, etc. The (evil?) genius of the Leave campaign was to draw a link in the public mind between our EU-membership and the things people care about... "You are worried about immigration? That's the EU's fault. You feel poor? That's the EU's fault. You want a better-funded health service? Let's use the money we give to the EU. etc." The Remain campaign could have done something similar but they did not. Of course, none of those statements is provably true or false. Where there's certainty, there's no room for politics. I think that idea: "they don't care about my objective so I'll just link my objective to what they do care about" might be a relatively new one in the world of politics. I'm not aware of another example in British politics anyway - perhaps somebody here can correct me? What made Europe rule the world? Institutional competition. Any time a scientist, businessman, inventor, artist or similar fell out with the ruling king, there was always another country where he was welcome. EU is killing all that (by coincidence, two non-EU countries in Europe, Switzerland and Norway, are among the richest countries in Europe) competition, making Europe stagnant and losing its influence (yes, Hitler is also a culprit). Europe should be grateful that the Roman Empire fell, otherwise Europe might have developed like China och India - that is, much slower than what actually happened. Yes, free trade is good but that is a unilateral thing. Just open your borders for import and if the taxpayers in another country wants to subsidize your consumption - just be grateful for their generosity. What are the political reasons for a strong Euroscepticism in Britain?